"Had fun as 3:00 pacer! " I had fun in my second year as a pacer at the Coastal Delaware Running Festival in Rehoboth Beach! I paced the 3:00 group for the half marathon with Beast Pacing. This race has a beautiful course, taking runners out and back on the Gordon's Pond Trail. It's a crushed stone trail and the whole course is very flat. It's not a technical trail. There are a few small inclines that a runner from a flat area might notice. The only problem for someone at the back of the pack was that there was a crossover in the course, where there were runners coming back from a loop. We had to turn left while people were coming toward us, so I felt like I was cutting across traffic. There was also another little out-and-back that could have been better marked. There were plenty of aid stations that had water and Gatorade. After the race, there was a full buffet at Grotto Pizza, which had pizza, baked ziti, chicken tenders and salad. There was also beer. The full lunch afterward was a really nice perk! There were also free race photos. I stayed at a nearby hotel, but parking is generally pretty easy in Rehoboth Beach in the off-season, and it's free during this time of year. I would still recommend getting there early just to ensure you get a good spot. There wasn't much of an expo, but the expo isn't something I really care about. There was not race-day packet pickup, so my friend and I picked up our packets the day before at a local church, and I picked one up for another friend, too (I needed a form from her and copy of her ID). TriCycle and Run was set up with running gear/nutrition/clothes, and the race also had race-branded clothes for sale. Race swag was awesome and included a shirt (not really a running shirt but more of a casual shirt), a pint glass, a magnet, and, upon finishing, a BOCO Gear visor. The medal was also nice. I enjoy this race and hope to be back as a pacer next year! "Fun race as always! " I love the Tim Kennard River Run! This was my ninth year participating in the race, and I joined the race committee this year. My running club, the Eastern Shore Running Club, is also a sponsor, and I got a free entry. A lot of the local running community comes out for this event, and it's always a lot of fun. The course is flat and fast, starting and ending at Salisbury University and taking runners through nearby neighborhoods, along the Wicomico River and into downtown Salisbury. There were five water stops on the 10-mile course, and the course was well-marked and easy to follow. This year, the women's shirts were pink, which I loved. The overall winners earn monetary awards, and there are prizes for the Top 3 in each age group, too. Afterward, there is plenty of good food — chicken and dumplings, chili, popcorn, bagels, small sandwiches and more. It's very easy to park in the Guerrieri Student Union parking lot, and it's free. The race directors are my friends, but either way, I would say this race is well-planned and everything went smoothly. There is packet pickup the day before at the Evolution Craft Brewing Co. Public House, but not much of an expo. I set up a table for the Eastern Shore Running Club, and there were a couple other tables as well. "One of my favorite races! " This is one of my absolute favorite races, and this was my sixth year running it in some capacity. I ran the full in 2013 (my first full) and 2014, and I have run the half each year since then. This year, I paced the 2:30 group for the half. It's set in beautiful Rehoboth Beach, Delaware. The race starts at the bandstand, continues on roads, and about six miles are run out-and-back on the Junction & Breakwater Trail. It's a flat trail that is not technical. The course is extremely flat. The full course heads up the Gordons Pond Trail into Lewes. Aid stations seemed very plentiful. I was thankful for all the volunteers who were out there in the cold. It's December, so you never know exactly what the weather will be, but this year, it was colder than any of the other years I'd run this race (it was about 30 degrees before the race). This race is known for its fun after-party, which has a ton of good food — things like mac and cheese, pulled pork, waffles — and Dogfish Head beer (runners get a wristband that allows them three beers). The after-party has a DJ (DJ Petch), dancing and singing outside, and a more relaxed party inside The Cultured Pearl. There is usually a really small expo at the packet pickup the day before, but this year, I picked up my packet the morning of the race, which was very simple. Parking was extremely easy — I did arrive more than an hour early because I had to be there early for pacing, but I parked basically steps away from the bandstand, and there were tons of spots. Parking is free this time of year in Rehoboth. Swag this year was a long-sleeve tech shirt — orange for the women's cut and light blue for the men's cut. The medal is also really nice! Race management is really top-notch. The race director, Mary Beth Hanna Evans, constantly responds to questions and makes people aware of what they need to know on the race Facebook group. I also received emails leading up to the race. And then on race day, everything went very smoothly from my perspective. Runners doing their first full or half, running clubs and people hitting other milestones (birthdays, anniversaries, etc.) are also recognized with signs on the course. I highly recommend this race and hope to see you next year! There's always a good discount for 12 hours on New Year's Eve (or until the spots for that deal sell out). 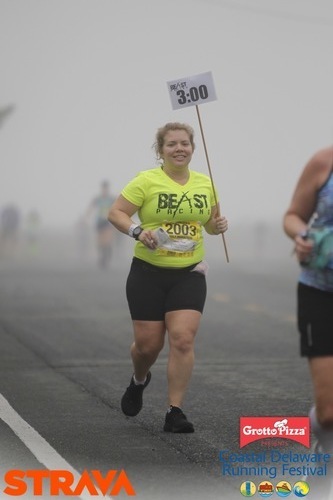 This was my fifth year running the Across the Bay 10K, which takes runners across the Chesapeake Bay Bridge. The bridge is closed to pedestrian traffic aside from this race, so it's definitely a unique opportunity to run across the bridge and get a different perspective. I'm giving T-shirts/swag a "2" this year because there was a spelling error on the shirt. The font is small, but it says "Queen Ann's" County instead of "Queen Anne's." As someone who really cares about spelling and grammar, I think it's crazy that this was misspelled on thousands of shirts and that nobody caught it. The medals are nice, and it's cool that they interlock, but runners were told that we would be completing a five-year medal puzzle this year, but the medal had an extra notch. This seems disingenuous and leads me to believe that the race organizers are trying to get people to run another year (even if they weren't planning to return) to keep their puzzles going. This is a cupless race, which makes sense because you don't want people throwing cups off the bridge, or have cups fall into the Chesapeake Bay. So, I carried a water bottle during the race and didn't use the aid stations. The expo is held the two days before the race at Navy-Marine Corps Memorial Stadium in Annapolis. Runners have to either attend the expo to pick up their shirts and bibs, or pay to have their bibs mailed to their homes — there is no race-day bib pickup. It was easy to park and get bibs and shirts when my friend and I attended Saturday, but there was nothing special about it that stood out to me. I give this race a "2" for elevation difficulty. I live in a very flat area, and there is a gradual incline to reach the top of the bridge. It's not extremely hilly, but for me, it was noticeable. It is nice to have the downhill after reaching the top. Parking was easy, but I'm giving it a "3" because we are charged to park in the parking lots to take the required shuttles. I paid $20 for a parking pass for the Kent Narrows Center. I think that's excessive when I already paid $60 to run the race. At least my friend and I drove together so we didn't both need to buy a parking pass. Race management I'm giving a "4." This race does seem to be very well organized and run smoothly — particularly for such a large race — but I was left feeling disappointed by some things, like not getting the completed medal puzzle that we were led to believe we would receive, and the spelling error. There were also no space blankets at the end, and it would be nice to get one free beer. 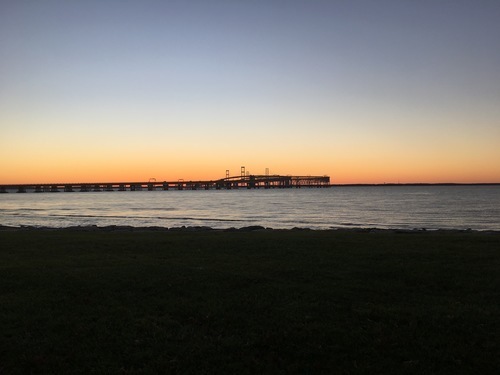 Despite the costs, I would recommend doing this race at least once, just to experience what it's like to run across the Chesapeake Bay Bridge. It is a fun experience!